Amazon Kindle Independent Publishing Platform. ISBN: 978-1721679225. Published 2018. Soft cover and eBook, 119 pages. One of the tasks on your genealogy ‘must do’ list is to write your family’s story. This task can seem intimidating, especially when there are multiple generations involved. Instead of focusing on multiple individuals, write a narrative based on the life and times of one specific individual? Author and lecturer Stephen Szabados has recently published a must-read new book which outlines this ‘one-person’ genealogical narrative perfectly. His book, My Polish Grandmother: From Tragedy in Poland to her Rose Garden in America not only provides a blend of facts into a well-rounded non-fiction narrative, it sets itself up as a carefully researched case study for individuals with foreign-born European ancestors. My Polish Grandmother chronicles the life of Anna Chmielewska, a woman of slight stature who possessed a commanding presence and fierce love for her family. Throughout the turbulent years spanning the early 20th century in the countryside of Poland, to the turbulent years of the Great War, a sea voyage to North America, and finally her life and experiences in the United States. Szabados delivers a personal family story in a manner and format which is relevant to genealogists of all abilities and experience levels. I really appreciated learning all of the small details of Anna’s life, and the author went to great lengths to provide both every day and crucial details in a way which is enjoyable to read. He makes important notes about availability of records, narratives, facts, and other essential information without interrupting the flow of the story. This is a great read which will please casual readers and researchers alike. When you’re finished reading this book, you may be inspired to sit down and begin writing your own family history. Even if you do not consider yourself to be a writer, and if English wasn’t your favorite class in school, there are so many different publishing and software products available which can help you on your journey to pass memories and stories down to the next generation. My Polish Grandmother: from Tragedy in Poland to her Rose Garden in America, visit Amazon.com or visit Steve Szabados’s website at https://steveszabados.com/. His site also offers a full list of his published books, Polish Genealogy assistance, and his speaking schedule. Published by CreateSpace. ISBN: 97 8-151.5286899; published 2016. 138 pages. Paperback. Every immigration story is unique. America has been a destination for over two hundred years for immigrants leaving their ancestral lands and family behind. While researching your family’s journey, it is important to examine the trends and history unique to specific ethnic groups. One of the best immigration resources placed in my hands this year is Polish Immigration to America: When, Why, How, and Where by Stephen Szabados. Polish immigration has a reputation for being difficult to research because of the fractured political history of the country; it can be difficult to sort out what factors and historic events fall into a specific geographic area. Breaking down immigration trends by time period and by region, Polish Immigration to America is approachable for researchers of all abilities and experience levels. Presented in an easy-to-read format, the book outlines the laws and economic factors behind leaving home, the extensive and sometimes dangerous journey to America, and the myths surrounding Polish immigration. An excellent introduction to the history of Polish immigration from 1600 onward. Overview of conditions, logistics, and experiences of the immigration journey. Maps and photographs for great visual reference. Case studies of Polish immigration from several time periods. Great information and insight into the immigrant experience. There are great details regarding emigration ports in Europe as well as arrival ports in the United States and Canada. There are several less well-known ports of departure which I had never had a chance to read about, and I found this chapter to be very interesting. The changes in immigration law and the approval process are also well documented in this book. In the rush to find an ancestral point of origin, it is easy to forget that immigration is a two-part journey. The journey and experiences of the author ancestors were excellent case studies on the subject. Providing a wealth of information, Polish Immigration to America is a comprehensive and complete guide for anyone pursuing this area of genealogical research. Polish Genealogy: Four Steps to Success, by Stephen Szabados. CreateSpace Independent Publishing Platform, 2013. ISBN 978-1490436494. 164 pages, paperback. Very few people who search for their Polish roots are satisfied when they have learned all they can about their U.S. ancestors. But some fear that looking for roots in Poland is too great a challenge. There are tools out there to help them. In Polish Genealogy: Four Steps to Success, Stephen Szabados lists and explains the important sources that can point to the towns/villages where your ancestors lived and how to find them. He sets the stage in the introduction for what you will find in succeeding chapters. This information is not just interesting but provides a historical context for understanding Poland and the partitions. That is information you need before searching for your roots, and knowing it can eliminate the confusion raised when documents show Polish ancestors found in or coming from Prussia, Russia, and Austria. In that first chapter, you will also learn of how waves of immigrants who came from the early 1880s to the 1920s made their way from the home village to the port of departure, dealing along the way with the documents and processes required, the challenge of border crossings, and then the voyage, which in itself could be a life-threatening experience. In the chapters that follow, you will get to the heart of the book’s best offerings. Chapter One concentrates on finding the location names, using all manner of documents, such as marriages, naturalizations, passenger lists, Social Security applications, and others. And don’t discount personal family stories. With that information in hand, the next step is to study the locations, giving consideration to the particular partition and possible border changes. At this point, you will learn about gazetteers and maps and take advantage of many recommended online sources. Knowing where your ancestor came from, you are ready for Chapter Three, which explains how to find actual records. Databases are discussed and potential websites are proposed and explained in over 25 pages. You will likely be amazed by the number and variety of choices. Chapter Four takes you to the last step: understanding the material you’ve collected, including various languages and writing styles you may encounter, as well as common words and terms in the records. You will find advice on using translators, both human and electronic. If you follow the steps provided, you are likely to be rewarded with more information than you thought possible. However, as we all know, genealogical research often encounters brick walls. But the book’s author does not abandon you; he provides suggestions and methods for finding another path around the wall. Find Your Family History: Steps to Get Started. Every experienced genealogist was once a beginner. This book offers those new to family history the steps they will need to follow to get started with their research. These steps are outlined in twelve chapters covering all of the basics including: searching at home for documents and photographs; using genealogy forms and lineage software; how to get organized, interview older relatives, researching census; vital; immigration; and other records; tips for searching online records; taking research trips; using message boards and posting your family tree online. There is also a chapter dedicated to continuing education and bibliography of additional resources. The author writes in a friendly, straightforward voice, and includes anecdotes, stories, and visual examples from his own research. There is a brief discussion of citing sources and evaluating data, and additional resources are mentioned for those who want to learn more about formatting their citations. There are plenty of illustrations — including family photographs, screenshots of family trees, and search screens from databases, such as Ancestry.com, FamilySearch.org, FindAGrave, CastleGarden.org, among others, sample census records, passenger lists, obituaries, naturalization petitions, and other key documents needed to track down information about an ancestor. The images are all in black and white, are clear, and easy to read, with arrows or lines to highlight key data. Each chapter includes a brief summary of key points covered in that chapter. The author does a nice job of including a wide variety of resources. Common records used by genealogists such as census records are covered in detail, but other resources, many of which are found offline, are also covered, such as funeral cards, employment records, and sources from genealogical societies. One essential resource not included in the immigration section was the One-Step Webpages by Stephen P. Morse, http://www.stevemorse.org. This tool is invaluable for mining the Ellis Island Database, http://www.ellisisland. org, and Ancestry.com for passenger lists. The site is listed in the bibliography section under “Useful Websites” as “Search Utilities.” Screenshots of using the site would be useful to the beginning genealogist. It would be helpful to the reader if the book had an index. The continuing education chapter notes books, genealogy societies, presentations and conferences, magazines, and online study. The online study section mentions the National Genealogical Society home study course, Ancestry.com and FamilySearch resources, but omits any mention of two big genealogy education providers: Family Tree University, http://www.familytreeuniversity. com, and the National Institute for Genealogical Studies, http://www.genealogicalstudies.com. Many of the popular genealogy blogs are listed, as well as social media sites Facebook and Twitter. This book includes a great deal of information packed into just 121 pages. The examples are helpful and clear, and a beginner should be able to follow each of the steps outlined without much difficulty. I would recommend this book to anyone who has been bitten by the family history bug but is uncertain about where or how to start. I also like the parting comment from Mr. Szabados who instructs his readers to “Have Fun.” With his book as a guide, they will. Finding Grandma’s European Ancestors. By Stephen Szabados. http://www.createspace.com/. Amazon.com. 2012. 148 pp. Illustrations. Softcover. $14.99. At some point in their research, many genealogists will need to make the leap across the ocean to track down records in an ancestor’s place of origin. But conducting research in Europe can often be a daunting task, especially for those just starting out. This book helps to make the research process a bit easier. 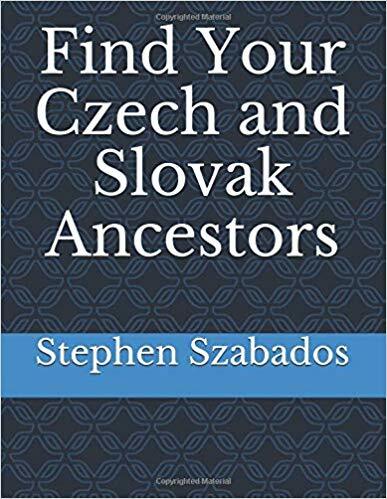 In 148 pages, Mr. Szabados tackles a broad subject with practical advice and useful examples, giving the reader gentle guidance on how best to track down ancestral birthplaces and the documents needed to do so. The author writes in a friendly, straightforward voice, and includes anecdotes, stories, and visual examples from his own research. This book is organized into sections instead of chapters. There is a brief introduction, followed by four main “steps.” Step one is “Finding Town Names” and covers the basics of how to track down documents from the “old country,” how to interview relatives, and the documents most likely to contain the name of the immigrant’s hometown. Step 2 is “Learn the History of the Country and Area”—a critical step since many countries experienced border changes (sometimes several times). Step 3 covers “Using Gazetteers and Maps,”—key tools for understanding the current and historical geography of a locality. Finally, Step 4 discusses “Finding Ancestor Records” and includes using the Family History Library and FamilySearch databases, tracking down records in the “old country,” dealing with German script and different alphabets and translating records. There is an unnumbered section entitled “Desperate Measures” (a pretty accurate description of how to solve brick wall problems!) that covers techniques, such as using genealogy message boards, forums, and online family trees to track down missing clues. However, there is no mention of social media (blogs, Facebook, Twitter, etc. ), which many genealogists are using today to locate long-lost relatives and connect with other researchers. Each section includes a brief summary of key points covered. There are plenty of illustrations—including family photographs, screenshots of family trees, and search screens from databases such as Ancestry.com, FamilySearch.org, FindAGrave, CastleGarden.org, and ethnic-specific databases such as JewishGen.org, and Geneteka. There are some very nice examples of census records, passenger lists, obituaries, naturalization petitions and other key documents needed to track down information about an ancestor. The images are all in black and white, but all of the images are clear, and easy to read, with arrows or lines to highlight key data. Appendix A includes useful websites and books and Appendix B includes some language helps (German handwriting chart, Polish alphabet, Hungarian alphabet, and Czech alphabet). As a Slovak researcher, I was disappointed that Slovakia is not covered or mentioned at all in this book. The Czech Republic is included, but nothing for Slovakia. I would have liked to have seen at least some Slovak resources noted in Appendix A (for example, the excellent Slovakia & Environs Slovakia Genealogy Research Strategies website by Bill Tarkulich http://iabsi.com/gen/public), and Cisarik.com http://www.cisarik.com/, not to mention the databases available on FamilySearch.org. Also, under the Czech section, the website for the Czechoslovak Genealogical Society International, http://www.cgsi.org/ is not included and it should be. In addition, it would be helpful to the reader if the book had an index. Overall, Szabados does a great job covering a massive and often complex subject in just 148 pages. The easy to follow steps are not overwhelming, which is good news for beginning genealogists.